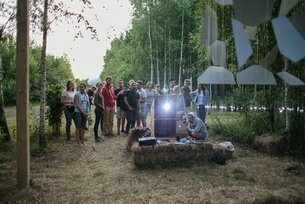 British Council partners with FutureEverything and Russia's Nikola-Lenivets Art Park to run a second Culture Shift, in preparation for the FutureEverything Moscow festival in November. FutureEverything (Manchester's R&D hub for digital culture) and the British Council, in partnership with Nikola-Lenivets Art Park, are hosting a second Culture Shift/Art Lab on 22-25 May, 2014. This will be the second edition of our Russian digital art lab programme, which we launched last September at Moscow's Strelka Institute for Media, Architecture and Design in preparation for theFutureEverything Moscow festival (November 2014 - more information about this soon). The 48-hour hackathon will generate ideas and installation projects for Nikola-Lenivets' big annual New Media Night (which takes place on 5 July 2014). As with the previous art lab, Digital Emulsion seeks to provide a space for creative ideas' generation through rapid prototyping, creative experimentation and low risk play. The programme will focus on the use of vvvv and custom-built digital emulsion shaders, and will be run by Tom Higham from FutureEverything and British/Korean digital artists Kimchi and Chips (Mimi Son and Elliot Woods). The team with the best concept will come back to Nikola-Lenivets in July to perform their installation at the New Media Night alongside Kimchi and Chips, who're developing an artistic commission around one of the Art Park's sculpture, an architectural object called Universal Mind. Nikolay Polissky with his creation, Universal Mind (2012). - mathematics: multiview geometry and volumetric rendering. CultureShift is a pioneering programme that encourages open collaborations between people who have different skills to create something original. This is a unique chance to develop new skills, apply existing ones, meet new artists, present your work at one of Russia's most significant media arts events, and work with a renowned group of UK digital experts. If you identify yourself with the profile description above, please complete the application form here before 18 May, 2014. The workshop will take place at Nikola-Lenivets Art Park, 200km from Moscow in the Kaluga region. Transport, accommodation and meals will be provided by the organisers, as well as vvvv platforms and custom softwares. If you require any specific equipment please feel free to bring it along! Thursday 22 May: Travel to Nikola-Lenivets - welcome drinks and introduction to programme. Friday 23 May: Art Lab day one - workshops, discussions and development of ideas. Saturday 24 May: Art Lab day two- workshops, discussions and development of ideas. Sunday 25 May: Presentation of projects, selection of winning entry and travel back to Moscow. The programme will take place in English with no translation. Participation is free of charge but you need to attend the whole 4 days. A more detailed programme will be sent to selected participants closer to the event. For more information about the programme, please contact Lidia Khesed at Lidia.Khesed@britishcouncil.org or on +7 (495)2871804. FutureEverything and British Council's will run 2 labs as part of their Moscow programme - sign up here! FutureEverything Moscow is a UK/Russia culture and technology exchange programme curated and produced by FutureEverything and the British Council as part of the UK-Russia Year of Culture 2014. We spent 5 minutes with digital and light artist Elliot Woods from Kimchi and Chips - our partners in our latest Russian Culture Shift programme. Check out Visual Silence and the other incredible winning prototypes which came out of our first Culture Shift Russia programme at Strelka Institute for Media, Architecture & Design. Tom Higham, Executive Producer at FutureEverything, reflects on the experience of running Russia's first art hack as part of our global Culture Shift programme. FutureEverything partners with the British Council and Moscow's Strelka Institute to jointly host Russia's first CultureShift this September.